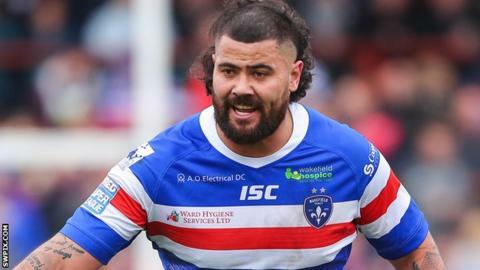 Prop David Fifita has signed a new deal which will keep him at Super League side Wakefield Trinity for the next three years. The Tonga international has been at Belle Vue since 2016, having made 72 appearances and scored 14 tries. Fifita, 29, is the current Steve Prescott Man of Steel leader for his performances in the Trinity pack, with five tries in 10 games this term. "I want to give something back to the fans," Fifita told BBC Radio Leeds. "My goal in the next four years is to try and bring a trophy, any trophy, I'd be happy with anything." Fifita's arrival has coincided with a boom period for Trinity on the field, with Chris Chester's side making the top eight in the past three seasons. Wakefield, fourth in the table after 10 games this term, are now looking to improve on successive fifth-placed finishes. The next aim for the former Cronulla front-rower is to be part of a play-off campaign - having just missed out two years in a row. "I want to be around for everything," Fifita added. "I want to be here for the new stadium and I want to be here when we win a cup. "All this talk that we're a second-tier team really hurts - I want to be a part of the team that changes that and becomes a first-tier team."